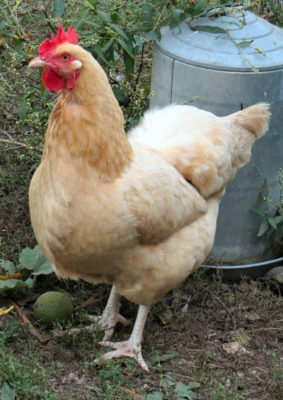 I need a cover for “Mistaken Promises” and have decided to use a Buff Orpington hen on it. This means I am taking chicken pictures. Goats are challenging. They love to strike unattractive poses, hide behind the other goats or drift out of range. The target Buff Orpington hen has spotted me. She is tossing dust over her feathers and watching me warily, ready to flee. Chickens are worse. Well, my chickens are. They seem to believe the camera is a long distance way to turn them into chicken dinner. There is another challenge. The gray fox picked off all but one nice Buff Orpington hen. She is skittish. Spare gate posts lean up against the barn. 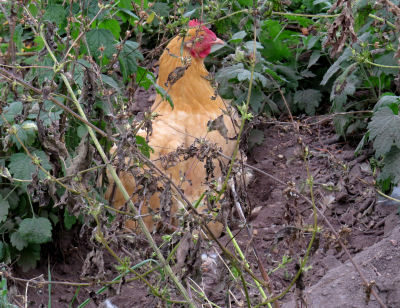 The Buff Orpington hen considers them an excellent place to hide. Since the background isn’t very important for these pictures, I can go taking chicken pictures in their yard or when they are out eating grass and bugs. It does give me something to do while guarding my hens. My vision of this cover is a hen standing looking out with a note hanging out of her beak. This means I want a pose with the hen standing upright and looking at the camera. This might be a good pose. Can’t you see the note hanging out of her beak? That foot would have to come down on the ground. This picture has possibilities. 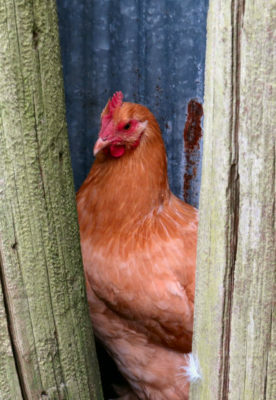 This hen prefers to face away from the camera. Failing that she pecks at the ground. If this doesn’t discourage me, she races off and hides. There is another aspect to taking chicken pictures that seems strange. Chickens, like other birds, have relatively immobile features. They do not smile or frown like we do. I found it surprising then to find this hen can add emotional aspects to her face. it must be from using her eyelids. She can look very disapproving, even snooty. 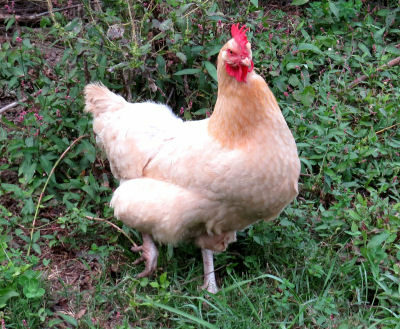 This might be a good pose of the Buff Orpington hen. She is definitely unhappy and glaring at me. I must conclude my hens hate having their pictures taken. Of course, I can’t know that’s how she feels. Her vocal complaints do seem to echo her expressions. Chickens can sound very disapproving, especially when they think I am taking too long to open their gate. The gray foxes have moved on, for now. The chickens seem to have short memories, but are still jumpy. They are impatient with my precautions. My taking chicken pictures doesn’t help the jumpiness or impatience of the chickens. All they want is to be left to go out eating grass and bugs. No cameras invited. This entry was posted in High Reaches and tagged "Mistaken Promises" by Karen GoatKeeper, Buff Orpington chickens, designing book covers on October 3, 2018 by [email protected].